This week the UN World Food Programme (WFP) announced it had started distributing aid in Sudan‘s conflict-affected Blue Nile state. Previously WFP had not been granted access to this area where rebels (SPLM-N) are fighting Sudan’s government. Now food aid must be allowed into South Kordofan state which, like Blue Nile, has been devastated by this same conflict. 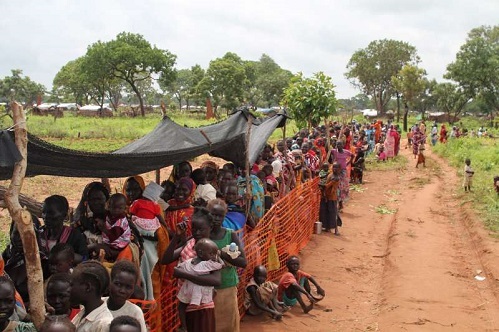 There are reports of tremendous suffering in South Kordofan. Yet aid is not allowed to go through. Currently, the World Food Programme and aid groups are able to operate only in the government-held areas of South Kordofan. Save the Children Sweden has done nutrition screenings for children under five years old in parts of South Kordofan under government control. So far 89,482 have been screened with around 15,000 of the children either moderately or severely malnourished. Plumpy’Nut, a special peanut paste, is being used to treat the children. Without the treatment children will suffer lasting physical and mental damage from malnutrition. With reports of people living off roots and leaves in the conflict zones of South Kordofan, malnutrition rates would be expected to go much higher. The World Food Programme and other aid groups need access to all of South Kordofan. Article first published as Aid Groups Need Access to Starving People in Sudan’s South Kordofan State on Blogcritics.